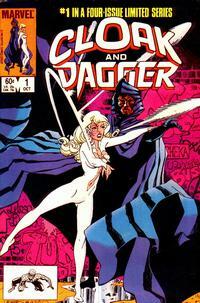 The original Cloak & Dagger comic mini series was one of my favorite series as a kid. It’s a bit dated in its portrayal of characters, but over all it’s a really good. Two kids run away and get swept up with dangerous people. Which normally doesn’t happen to runaways, but this is comics so that happens. Like all the time. But it’s a good one that covers drugs and drug addiction. Not in the jokey way that comics had done before with Speedy and Green Arrow yelling about Speedy being a JUNKY!!!! Comics History note: many people claim that the first use of drugs in comics appears in Spider-Man with Harry Osborn popping some pills or DC Comic’s Green Arrow’s sidekick shooting something up. They’re wrong, drug use stories appeared in Pre-Code comics like Detective Comic’s Johnny Law #25 published in 1937. The earliest one I know of was titled The Marijuana Racket. It’s a 7 page comic story in the vein of Reefer Madness. Anyway, Marvel Studios is continuing the take-over of all media by launching a new hero TV show. They’ve turned Cloak & Dagger into a cable TV series. they recently released a trailer. I’ll be honest after the trailer. So, in terms of accuracy to the source- I think they’re nailing it. The two actors in the lead rolls look like the characters. they have a specific origin story that involves both of them running away. So far, looking good. But there’s something off here. I can’t put my finger on why I don’t like this trailer. Maybe it’s the crap music. Maybe it’s the lower special effects budget. I don’t know but I’m seriously underwhelmed. Don’t get me wrong, I’ll watch every episode of the first season. But right now I’m a little wary. In which I explain why I bought my 5 year old his own bottle of whiskey.